“Experiences of Passage: The Paintings of Yun Gee and Li-lan” included paintings representative of the careers of a father and daughter. Yun Gee (1906 – 1963), one of the first Asian-American modernists and increasingly appreciated as a painter of considerable achievement, was born and raised in a small village near Canton in China. A naturally gifted painter who later shuttled back and forth between Paris and New York, Yun Gee developed a style with roots in Cubism. His remarkable skill as an artist was not fully recognized either during his lifetime or in the decades immediately following his death. Yun Gee immigrated to San Francisco in 1921, but moved to Paris a year later. His travels resulted in a hybrid style, as in the smallish (20-by-16-inch) oil titled Where Is My Mother (1926-27). In it, he renders a moving portrait of himself weeping, next to two other people, one of whom is also crying. Above them is a colorfully faceted, abstract landscape in which one can discern a female figure and a ship. Clearly, the painting refers to the sorrow the artist experienced on leaving his native country. Another small work, an oil on paper titled How I Saw Myself in a Dream (ca. 1929), shows the artist striding confidently through a narrow European street with a walking stick. On either side of him rise the angular forms of houses. 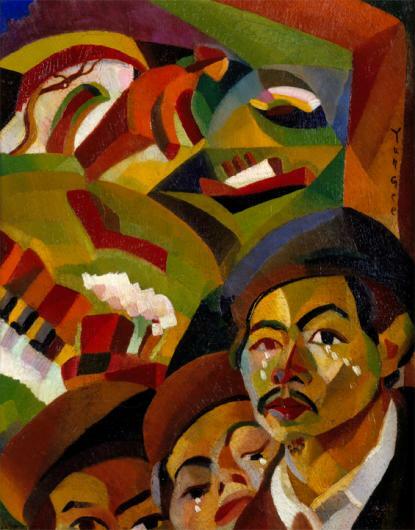 In the 1930s, Yun Gee moved to New York, where he wrote poetry and continued to paint, but his efforts met with indifference. Born in the U.S., Li-lan has had a long career herself; now living in New York City after previous stays in Japan and China, she paints with meticulous precision images of envelopes and stamps that refer to her experience as a biracial artist (her mother was American) and seasoned traveler. 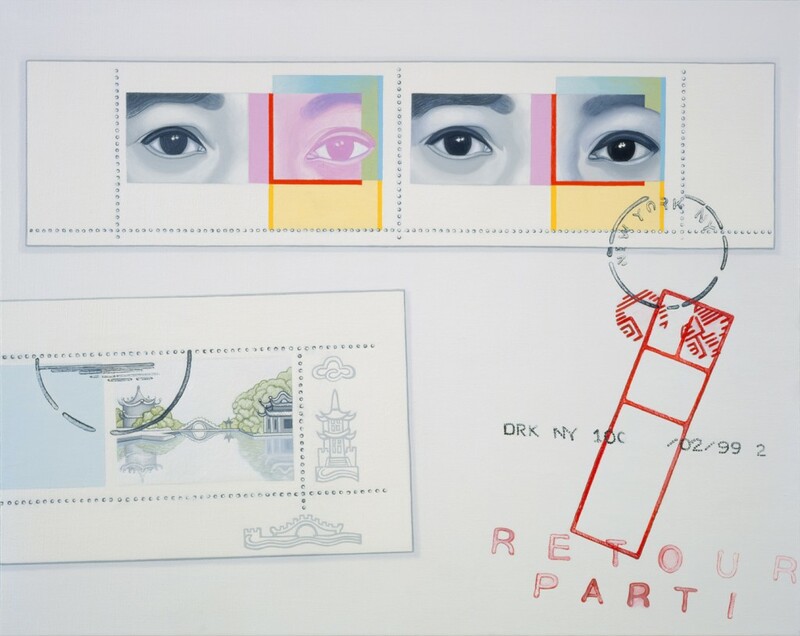 In Chinese Bridge (1999), an oil on linen (24 by 30 inches), she has painted her eyes gazing directly out from a depiction of perforated postage-stamp paper. Below is another stamp showing a foliated Chinese landscape with a bridge connecting a pagoda to a pavilion. In Look Out (2004), another smallish work, we see the partially hidden face of the artist on the right. Three bees add an element of naturalistic whimsy, while two canceled stamps depicting the facades of buildings round out the composition. Li-lan depicts wonderfully well the randomness of cultural connections through the simple device of the stamped letter, whose journeys allow her to include images from all over the world.